A large-scale initiative such as PBLA works best when responsibility for success is shared. In PBLA, this interdependence has been articulated in two important contexts: a framework for a practice review, and the statements of stakeholder roles. 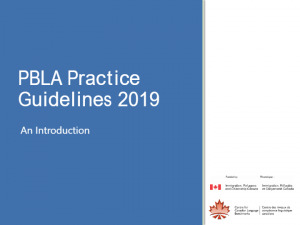 The PBLA Practice Review Framework (CCLB, 2017a) is a self-assessment framework developed to support PBLA sustainability. 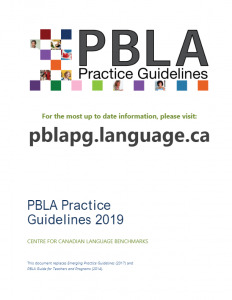 It recognizes that the responsibility for PBLA success is shared by teachers, programs, funding authorities engaged in monitoring language programs, and national authorities responsible for setting language policy. It recognizes that continuous learning and self-assessment is an essential part of both classroom assessment practice and professional practice (CCLB, 2017a). The framework is based on the work of the Assessment Reform Group in the UK, whose research and writing influenced many of the assessment principles underlying PBLA. They, along with 200 other assessment experts, were part of the Analysis and Review of Innovations in Assessment (ARIA) project, working together to better understand the processes that support the sustainability of large scale teacher assessment initiatives (Harlen, 2010). The group found that sustainability depends on agreed-upon assessment principles and standards, to ensure that all stakeholders share an understanding of the aims of assessment, and can assess its effectiveness (Harlen, 2010, p. 8). The following broad principles, adapted from the ARIA project, inform the PBLA initiative. Assessment should be part of a process of teaching that enables learners to understand the aims of their learning and how the quality of their achievement will be judged. Assessment methods should promote the active engagement of learners in their learning and its assessment. Assessment procedures should include explicit processes to ensure that information is valid and is as reliable as necessary for its purpose. At the same time, assessments of learning should be treated as approximations, recognizing the limitations of all forms of assessment. Assessment should combine information of different kinds, including learner self- assessments, to inform decisions about learning and achievements. Assessment should promote public understanding of learning goals relevant to learners’ current and future Policy makers and organizations that require CLB levels need to be aware of the assessment methods being used and their suitability for reporting learner progress and achievement. Assessment methods should meet standards that reflect a broad consensus on quality at all levels, from classroom practice to national policy. PBLA works best when classroom teachers, lead teachers, administrators and funders work together to support effective assessment practices. A number of roles and responsibilities are in place to ensure this happens.